Mark has built his practice on a belief that an individual’s right to superior legal representation and a fair trial is not merely a key tenet of our United States Constitution, but also fundamental to all persons’ health and well-being in our community. For this reason, Mark exclusively represents individuals who have suffered harms, injuries, and losses caused by others’ recklessness, negligence, wrongdoing, or corporate greed. For the past forty years, Mark has diligently advocated on behalf of victims of car, truck, plane, and train crashes caused by driver carelessness or recklessness; those injured or made ill by doctor and hospital negligence and other medical malpractice; individuals harmed by exposure to environmental toxins, such as lead poisoning; and those suffering from other catastrophic injuries, such as brain injuries and birth defects, for example. In 2009, Mark was named Lawyer of the Year by Missouri Lawyers Weekly for his successful advocacy on behalf of a family devastated by an automobile collision with a drunk driver that resulted in an $89 Million Jury Verdict. In 2012, Mark was again named as “Lawyer of the Year” by Missouri Lawyers’ Weekly as well as the Public Justice Foundation for his more than fifteen-year long legal battle against the Doe Run lead smelter in Herculaneum, Missouri, for their contamination of the surrounding neighborhood and the lead poisoning of hundreds of nearby residents (read more about this case here). After graduating with his Bachelor’s Degree in Business Administration/Accounting (B.S.B.A.) from the University of Denver, Mark began his legal studies at the University of Missouri-Columbia School of Law, earning his Juris Doctorate (J.D.) in 1973. Mark joined now-senior partner Leo Newman at the longstanding law firm Goldenhersh & Newman, founded in 1958, to commence his practice of law as a plaintiff’s personal injury litigator. Within three years, Mark became a named partner at the newly-designated Newman & Bronson. 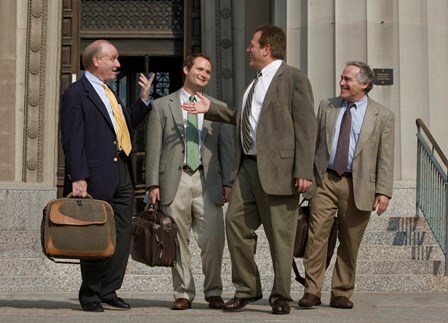 Since then, Mark has grown a successful practice and earned a reputation as a highly skilled trial attorney. Member of Trial Lawyers for Public Justice, Missouri Association of Trial Attorneys, and American Bar Association. Mark is admitted to the Missouri and Illinois bars and is admitted to practice in the United States Supreme Court, the U.S. District Court for the Eastern District of Missouri, and U.S. Courts of Appeals for the Eighth, Seventh, and Second Circuits. Born in St. Louis, Mark is a longtime native of this city, where he and his wife raised their three children and are actively involved in numerous community and charitable organizations. 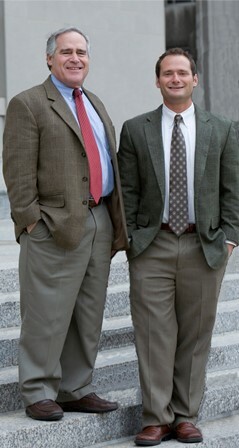 Today, Mark is at the helm of a thriving legal practice in St. Louis, MO, where he enjoys the occasional opportunity to join legal forces with his son Steven (licensed in California and Missouri), and is proud to watch his newly-licensed daughter Lauren (recent law school graduate of Mark’s alma mater, the University of Denver) work on toxic tort cases in Colorado. In his free time, Mark gathers his family, including his wife Sue and children Steven, Ryan, and Lauren, and together they travel to far destinations such as Iceland and Norway for hiking, climbing, skiing, and other adventures.